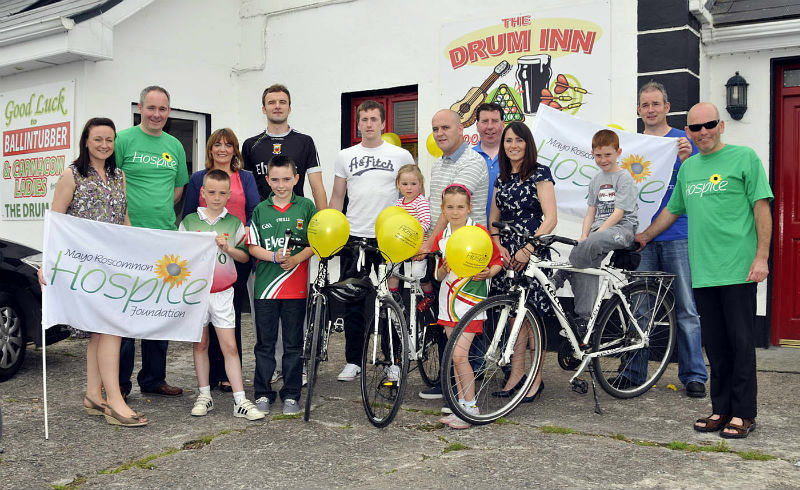 Members of the Mayo Team, Damien and Caroline Flatly and Mayo Roscommon Hospice Foundation gathered on Sunday last to launch a 70KM Cycle to raise much need funds for the foundation. The cycle will begin at 10am Sunday 4th August. This cycle will take a scenic country route and is open to amateur and pro cyclists alike. The course will begin at the Drum Inn Clogher, going on to Ballinafad, Mayo Abbey, Robeen, Ballygarrett, Moorehall, Errew, Castlebar, Breaffy, Manulla, Belcarra finishing back at The Drum Inn. There will be a stop off at the Moorehall for some light refreshments and water breaks along the way. A big Thanks goes to Mulroys Londis in Castlebar for the sponsorship of the water for the race participants. All proceeds from the cycle will go directly to Mayo Roscommon Hospice Specialist Palliative Care Service. The Service is free of charge to all who need it. The Foundation currently has to raise €1.3 million per annum to fund the service in Mayo and Roscommon. Plans to develop a 14 Bed Specialist Unit in Castlebar and an eight bed Unit in Roscommon Town are well under way. Mayo Roscommon Hospice will fund 100% of the cost of the build which is due to come in at approximately €13 million. The Foundation will begin this project later this year with the purchase of a site in Castlebar for the Mayo Unit. Damien Flatly who is organising the race has said that all are welcome to participate; everyone is doing it for different reasons, some for the hospice, some for competition and many for the enjoyment! There will be a BBQ and after cycle celebration from 6PM in The Drum Inn open for all. If you would like to participate in this cycle, gather sponsorship or show support please feel free to get in touch with Mayo Roscommon Hospice Foundation on 094 9388666.